The elliptical cross trainer is one of the most popular fitness machines and it's no coincidence! The elliptical workout is indeed very effective in burning calories and toning most of the muscles of the body. But what muscles does it really work? How many calories are burned in 1 hour of elliptical trainer? And how many kilos do you lose when you exercise on your cross trainer every day? What are the other positive effects of the elliptical machine? Here are the 10 benefits of the cross trainer on your body and your health! 1.The cross trainer is effective for weight loss! The elliptical bike offers the perfect training to lose weight because it is very effective for burning calories and fat! The elliptical workout allows to burn between 450 and 830 kcal per hour, which is 2 to 4 times more than walking! During an intensive workout, also known as high intensity interval training (HIIT), you burn a lot of calories in a very short time, over 800 kcal per hour. However, when you exercise at medium intensity, in the aerobic area, that is less than 80% of your maximum heart rate, your body burns fat stores as a source of energy. A medium intensity cardio workout is therefore effective in burning fat! Which workout is more effective to lose weight: cardio or HIIT? the most recent scientific studies show that a combination of cardio and HIIT workouts seems to be the most effective way to lose weight. To lose 1 kg, you should burn 7000 kcal. You should therefore exercise on your elliptical cross trainer every day for 20 min at a high intensity (250 kcal per day) to lose 1 kg in one month. Or, and this is what we recommend, use your elliptical for 1 hour 3 times a week alternating cardio and HIIT exercises. For more tips, workout plans and training programs to lose weight, read our article on how to use a cross trainer to lose weight. 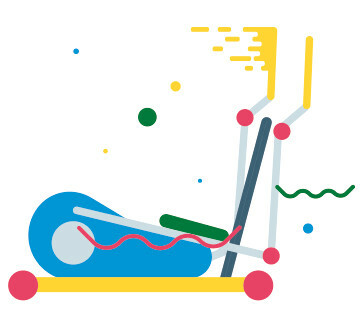 The elliptical bike to lose weight: How long should you exercise to see the effect? To get results, you have to persevere! Do not try to lose as much weight as you can in a short period of time, but rather get into the habit of exercising regularly. Aim for the long run, this is how you can lose weight in a sustainable way (and not gain it back). 2. The elliptical cross trainer to tone the muscles of the legs, thighs, buttocks and arms! The great advantage of the elliptical trainer is that it allows to work both upper body muscles (biceps, triceps, abdominals, pectorals) and lower body muscles (legs, thighs and buttocks). The other advantage is that it is possible and even recommended to target the different muscles of the body by varying the exercises and the way you workout. This helps to target the weaker and less trained muscles. - The muscles of the lower limb (in red on the diagram): buttocks, hamstrings (just below the buttocks), quads (or quadriceps, on the front of the thighs) and calves (at the back of the thighs). When you are pedaling backwards, the hamstrings and the buttocks are targeted, while the quads work more while you are moving forwards. To maximize the effect of an elliptical reverse (pedaling backwards) on your glutes and hamstrings, put your buttocks back a little as if you wanted to sit down while keeping your knees at a 90 degree angle as you stride. - The muscles of the arms (in yellow on the diagram): the biceps and the triceps. You will work your biceps more when you pull the handles while pedaling and target the triceps when you actively push the handlebars. - The muscles of the back and chest (in yellow on the diagram): the latissimus dorsi muscle (or lats, which form a large V shape on the back) and the pectorals (or pecs, the chest muscles). The back muscles work when you pull the handles and the pecs are used when you push the moving handlebars. You can also stride without holding the handles, which will improve your body posture and balance. - When striding, do not put all your weight on the front of your feet or on your toes. Do not hesitate to put your weight on your heels in order to have the largest part of your body muscles work out. - If your goal is to tone and strengthen your muscles, then increase the resistance of your elliptical bike. Indeed, muscles need resistance to work and develop. - Always keep your back straight when exercising and do not look at your feet while pedaling on your cross trainer. - Alternate exercises and movements: pedaling forwards, backwards, actively pulling or pushing the handles, sitting back while holding the stationary handles in the middle, striding without hands, etc. - The elliptical machine is not a strength machine! It allors you to strengthen and tone the muscles of your legs, thighs, buttocks and arms but not to develop them as you would do with weights or on a strength machine (unless you push the resistance to the maximum and workout several hours per day). - If your goal is to lose weight, it is important to tone your muscles in order to get an athletic body. How long does it take to see the effect of the workout on the body? The results do not happen overnight but come progressively. It all depends on the intensity and duration of your workout as well as the frequency of your training sessions. It takes at least 1 to 2 months to see the first results and if you want to compare your body before and after you will see the effect on your body after 3 months if you have exercised regularly. In any case, you must persevere! The elliptical bike also works the most important of all muscles: the heart! And like all muscles, you need to exercise it regularly to make it stronger. The cardio workout (cardiovascular) the elliptical trainer offers is an excellent exercise to strengthen your heart and improve your cardiovascular capacity. A muscular and well-trained heart can pump a larger amount of blood into the body with each stroke and provide more oxygen to the muscles and organs, lowering blood pressure. A muscular heart also beats slower: the heart rate is lower in athletes than in people who do not exercise or have little physical activity. This has the consequence of improving the cardiorespiratory fitness. When your heart is well trained, you get out of breath less rapidly during an effort. In addition, regular training helps reduce the risk of cardiovascular diseases and strokes. Using an elliptical bike has great heart benefits, as long as you exercise regularly! It is recommended to workout at least 2 to 3 times a week for 30 to 60 minutes each time (or more). You will quickly see the positive effect of exercise on your heart. Measure your pulse at rest every week and follow the progress. You will also notice that you are getting out of breath not as quickly anymore after several weeks of workout. 4. Can the elliptical bike improve breathing capacity? Lung capacities and lung volumesrefer to the maximum volume of air that can be inspired and contained in the lungs. Activities such as snorkeling increase lung capacities but not the elliptical trainer training. The cross trainer does not increase your lungs volume but it does have some benefit on your breathing or, more precisely, to breathlessness. When you exercise regularly on your elliptical trainer, your muscles become more efficient: they consume less oxygen during exercise and produce less carbon dioxide, which means that need a lower volume of air to breathe during exercise. So you do not feel out of breath so fast anymore during exercise! Sports and regular exercise can also have benefits to people suffering from asthma, chronic lung disease or COPD and improve their symptoms. However, if you are concerned, you must seek the advice of your doctor before starting a physical activity. WHAT YOU SHOULD KNOW: Scientific studies have shown that lung capacities are not related to physical performance and that lung capacities of athletes, including marathon runners, were not larger than those of untrained athletes. The elliptical trainer, as well as sports and physical activity in general, is the most effective prevention against diabetes. Type 2 diabetes is a chronic disease characterized by a dysfunction of insulin in the body that usually appears from the age of 40 and affects nearly 1 in 10 adults. Insulin is a hormone whose role is to provide cells with sugar (glucose) so that they can use it as a source of energy. In type 2 diabetics, insulin no longer fulfills its role properly and sugar builds up in the blood. This is called hyperglycemia, that is to say an increase in the level of sugar (glucose) in the blood. Diabetes can lead to serious complications, such as cardiovascular accidents, kidney failure, blindness, and even amputations. Beyond genetic factors, it is believed that factors related to a sedentary lifestyle and lack of physical activity, including overweight or obesity, are the leading causes of diabetes. Exercising on a cross trainer has a positive effect on blood glucose levels (blood sugar level). Indeed, when we exercise, our muscles need energy and will use the sugar stored in our body, which leads to a drop in the blood glucose levels. Exercise and physical activity also have benefits on insulin. Sport makes our body more sensitive to insulin, meaning that less insulin is needed to get the same amount of glucose from the blood to the cells, thereby partially counteracting the effects of diabetes. Sport and training reduce the risk of and delay the development of type 2 diabetes and provide a better natural regulation of blood glucose levels. 6. The cross trainer makes you happy and less stressed thanks to the release of endorphins and serotonin! Sports, physical activity and exercise have real positive effects on your brain and your psychology! Playing sports and exercising allow you feel good and relieve stress! These benefits on your mood and well-being are explained by the release of hormones called the hormones of happiness, endorphins and serotonin. Indeed, these hormones provide us with a feeling of well-being, which may sometimes be very powerful and even close to euphoria when we workout for a long time like for one or two hours and it then called the "runner's high". They also have an anti-stress and antidepressant effect. That's why it's often said that sport is the best medicine! Learn more about the effects of sports on the brain. WHAT YOU SHOULD KNOW: Is the elliptical bike effective in quitting smoking? The secretion of endorphins during a prolonged effort reduces the symptoms of lack and can therefore help you to stop smoking. The elliptical trainer is often compared with running but one of the major advantages of the elliptical machine is that it does not cause any shock in the joints, unlike running. Elliptical movements are smooth and the elliptical bike is often recommended after an injury for the reeducation. The elliptical trainer is good for strengthening back muscles but if you already have back problems, you should be careful, as the rotation of your arms and shoulders may be contraindicated. Speak with your doctor beforehand if you want to use an elliptical cross trainer against your back problems or for rehabilitation. Cholesterol, contrary to the common opinion, is not bad; it is even essential to the proper functioning of your body! However, the excess of cholesterol can be bad for health and increase the risk of cardiovascular disease. Good cholesterol can be distinguished from bad cholesterol and what you need to know is that sport promotes good cholesterol and lowers bad cholesterol. Scientific studies have shown the positive effects of sports and exercise on cholesterol levels. People with cholesterol problems are strongly advised to exercise regularly and do sports! Just like the exercise bike, the cross trainer is a gentle sport that can be practiced at home without problems until an old age, even if the elliptical trainer is more demanding than the stationary bike. In any case, it is extremely important to stay active and do sports regularly as you age because sport keeps in shape! All scientific studies agree on that point. In addition, physical activity and exercise stimulate certain areas of our brain. Therefore, regular physical activity could not only reduce the risk of Alzheimer's disease and other degenerative diseases such as Parkinson's, but also delay their symptoms. More and more doctors agree thatsports is the best prevention against diseases related to old age. 10. The elliptical trainer workout is good for your health and to live longer! Working out on an elliptical trainer could also extend your life expectancy! Dr. Chi Pang Wen conducted a large study of over 400,000 people for 12 years. His findings showed that people who had an average of 15 minutes of physical activity per day had a life expectancy of 3 years longer than that of sedentary people who had practically no physical activity! Regular exercise can reduce the risk of many diseases, delay the onset of symptoms and also maintain the effectiveness of the immune system longer in older people, thus increasing life expectancy. If you want to buy an elliptical trainer, follow our advice for choosing the right elliptical cross trainer. 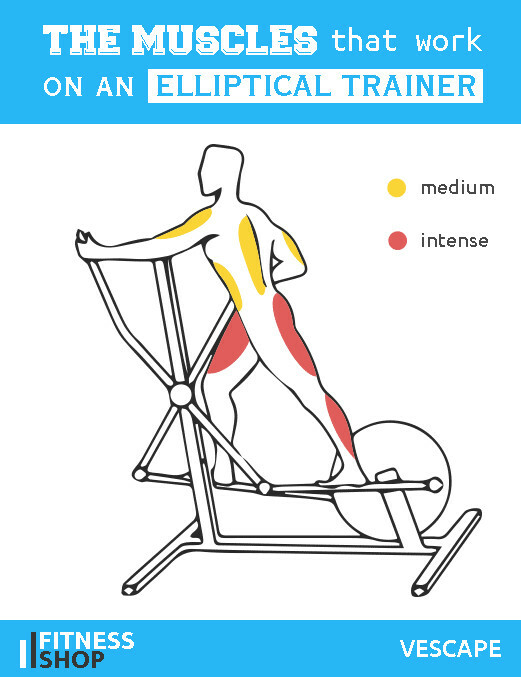 A last tip to enjoy the benefits of the elliptical trainer! Regularly exercising on your elliptical cross trainer will help you lose weight, tone your muscles, strengthen your heart, improve your cholesterol levels and decrease the risk of diabetes, cardiovascular disease and Alzheimer's. It can also increase your life expectancy! Finally, exericse will help you to feel good thanks to the release of hormones of happiness. According to the official recommendations of the WHO, it is necessary to workout at least twice a week for 45 minutes at high intensity, which means that you have to really sweat! 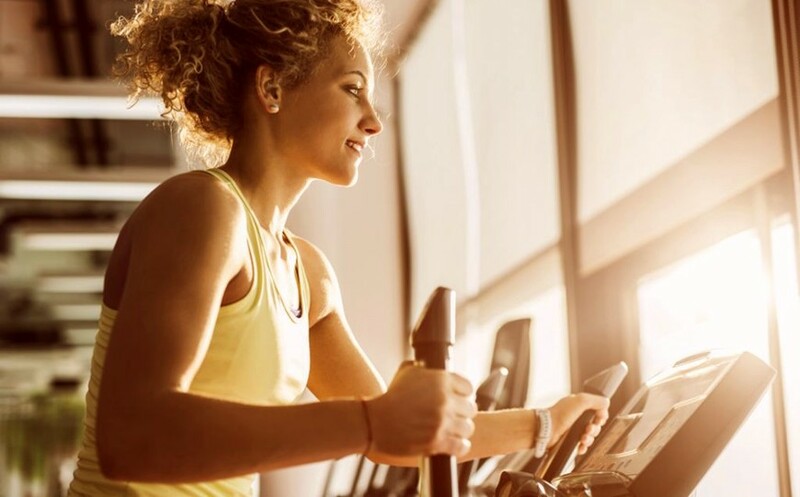 To fully enjoy the benefits of the elliptical trainer on your body, your health and your mood, you need to exercise at a relatively high intensity for a duration above 10-20 minutes! 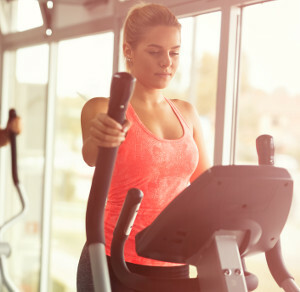 You now know the benefits of the elliptical trainer workout on the body, so share this article with your friends and family, this could change their lives!